I’ve heard a lot of talk about how Captain America: The Winter Soldier is the best Marvel movie. And I can see how this would be said: because it’s pretty damn great. It’s chock full of throwbacks to Captain America comics; Black Widow, The Falcon, Nick Fury…even Sharon Carter was in there, although I wish she had had a bit of a bigger role. Personally, I was losing it when Arnim Zola made an appearance. I just love when they take something that obscure and weird and make it creepy and cool. And creepy it was. 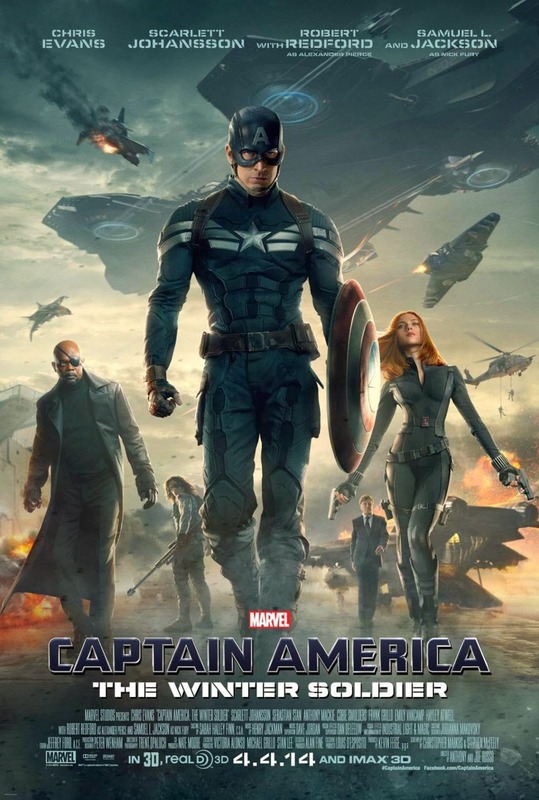 But I guess what I would say is this: Captain America: The Winter Soldier is the most pertinent Marvel movie. The questions it raises about the balance between freedom and order in the modern age are very timely, aren’t they? The problem with too much freedom without security is that things tend to get out of control--people commit crimes, wars break out, whatever. But the problem with putting too much power into one place is that before you know it, evil (aka Hydra) can slip in the back door and set itself up to wield that power. Things that were meant to be protective suddenly become oppressive. I heard someone once--maybe Joe Quesada--mention that a lot of fans like to write in and ask if Cap is a Democrat or a Republican, a liberal or a conservative. I thought Quesada (or the interviewee) had a very smart answer. He commented that he liked to think of Cap as not "red" or "blue," but kind of "purple." Cap is a solider, but he’s a soldier who’s dedicated to preserving freedom. It always seems to me that Cap represents the need to balance the scales between freedom and order. I’m not sure how these things go together exactly, but what I know is that Captain America: The Winter Soldier is about Cap re-balancing those scales when they start to tip the wrong way. And maybe it’s that kind of constant scrutiny and re-evaluation that’s the price of freedom. There is no perfect balance. All you can do is keep asking yourself "how is this going right now?" and be open to changing when things aren’t going that well. So what we end up with is a lot more than just a cool action movie that focuses on the gritty world of military espionage in the Marvel Universe, but a surprisingly meaningful and thought provoking film. And I’m glad that not only can Marvel re-focus the lens of their universe so that everything in Captain America comics seems like the most important part of what’s happening in their universe for a movie. It always feels like whatever character you’re watching is at the center of the most pivotal events--whether it’s Iron Man, Thor, Cap, etc.--but they can tell you a story that has some philosophical depth WITH that character. A lot of times, the themes in superhero movies tend to boil down to some very similar ones. But I’d like to think that Cap stands apart to some extent because he asks us question about the nature of order in our society and what kind of sacrifices we need to make to maintain that order. Captain America: The Winter Soldier is a good movie. Worth seeing even if you aren't a Cap fan. And THAT’S impressive, if you think about it.